It’s summer! But I am still, technically, a grad student until the end of my 6-week summer TA-ship… so the crazy feeling of having finished grad school probably won’t quite hit me until then. In the meantime, starting last week, I’ve been waking up early to teach (and grade for) a summer intensive course in first-year Japanese, and it’s led to something of a rude awakening: waking up early five days a week is exhausting! (Don’t laugh — after seven years of grad school, I have a lot to re-get used to…) The sad part is that Paula still wakes up earlier than I do and leaves the house before me… so obviously I have nothing to complain about. Since I can’t just sleep in or be home at odd hours during the weekdays anymore, Paula and I have kicked our weekend cooking into high gear: she makes us sandwich bread and a frittata to last all week for breakfasts, and for our lunches, I make tabbouleh-like hearty salads and gazpacho soup. 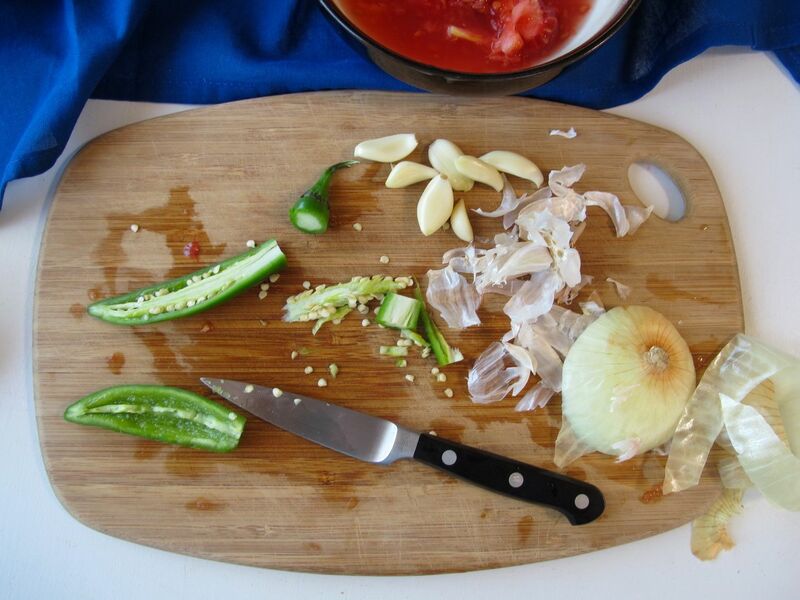 But not like the gazpacho soup that I used to make (which, granted, is quicker, since you can make it with either fresh tomatoes or a large can of tomato juice). 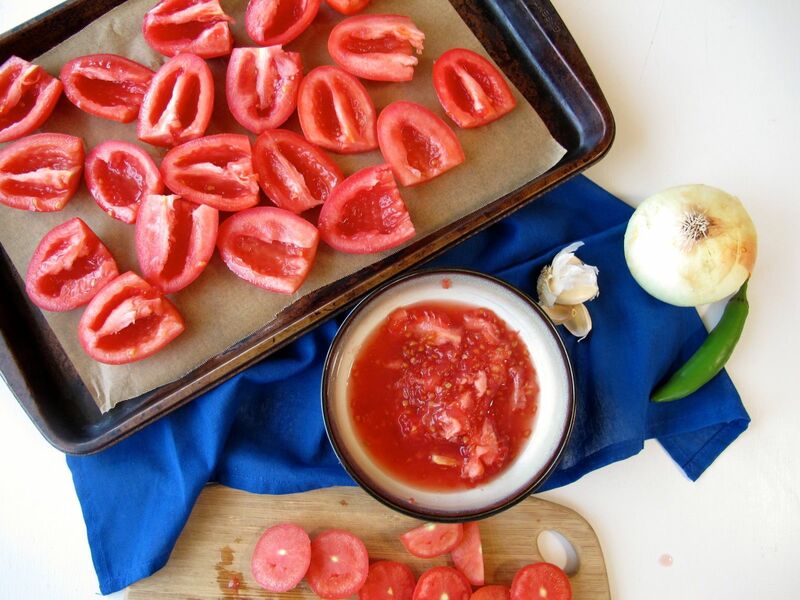 Since I first posted that recipe, the kind of gazpacho that has won my heart even more is made with oven-roasted tomatoes. 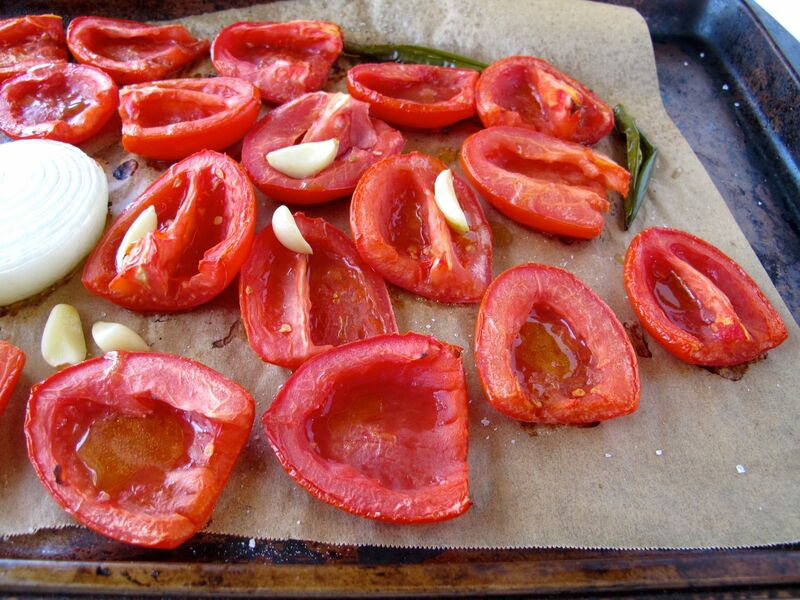 For this soup, I like to roast ripe, de-seeded roma tomatoes along with some onion, garlic, and a serrano. 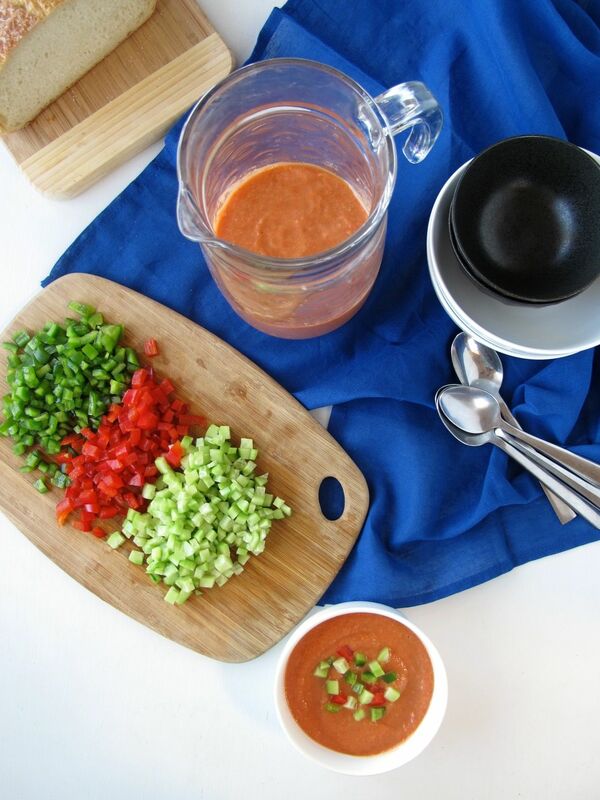 You can always skip the serrano and just add a dash of chili powder (or Sriracha) to spice up your gazpacho instead. The onions and garlic don’t necessarily need to be roasted (I use them raw in my other gazpacho recipe), but as long as they fit on my roasting pan / baking sheet, then they’re going into the oven, too! 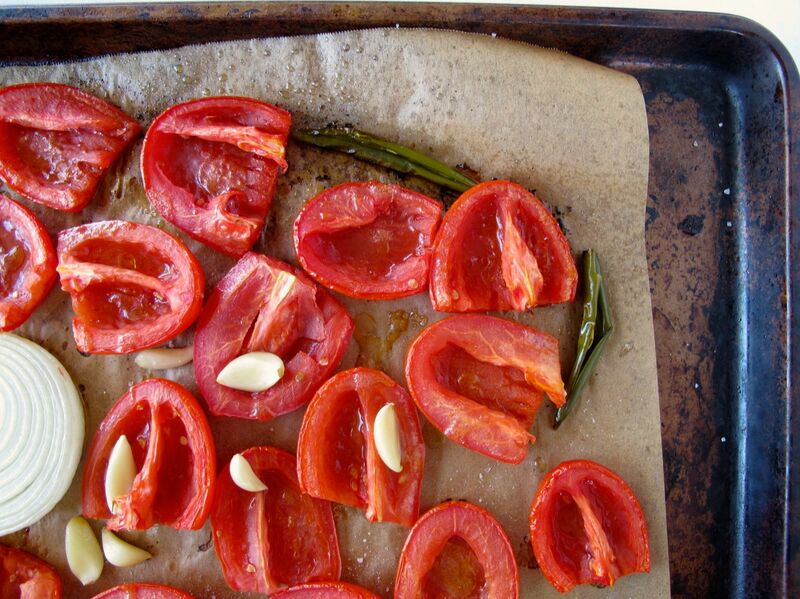 Roasted tomatoes are the most important element. They give the soup a more intense flavor (especially if your tomatoes aren’t quite at the peak of their season yet!). But roasting them, with olive oil and sea salt, also mellows their acidity a bit and almost seems to make them sweeter. Of course the sweetness is then counterbalanced by the vinegar/lime juice and the hint of spice. 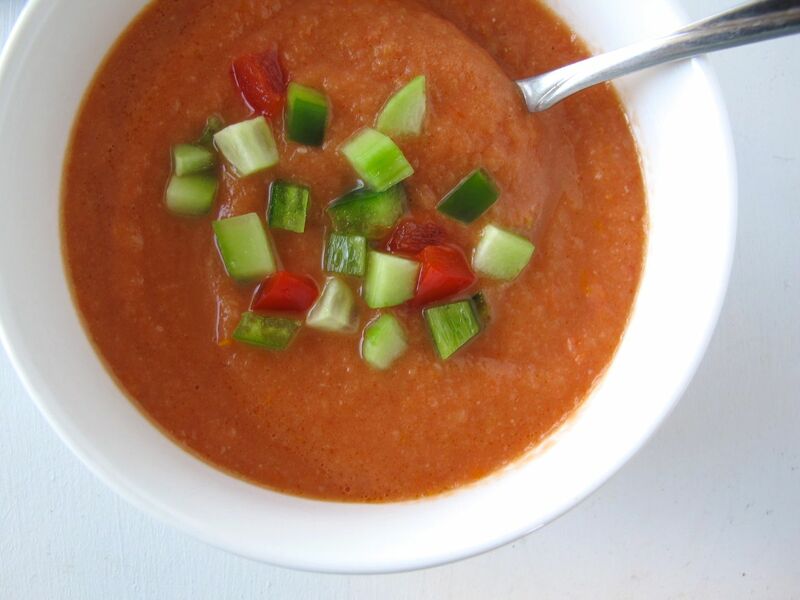 This gazpacho is less sharply vinegary than my previous version, so it doesn’t need to rely on a buttery garnish of avocado wedges to cut through the acidity. Instead, it relies on cucumber, blended into the soup, to thin out the broth and to stretch it across more servings. 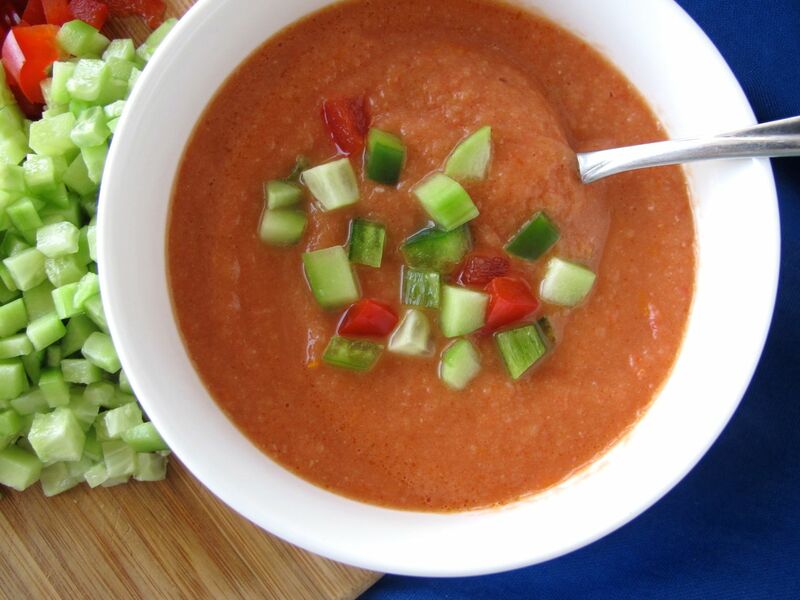 Paired with the intense concentrated flavor of roasted tomatoes, the cucumber makes this summery soup all the more refreshing. Perfect for a fresh, cold, and reinvigorating lunch on a hot July afternoon (or for a lunch quickly slurped up in between teaching and office hours). Active time: 25 min. ; Total time: 1 hour. 2. 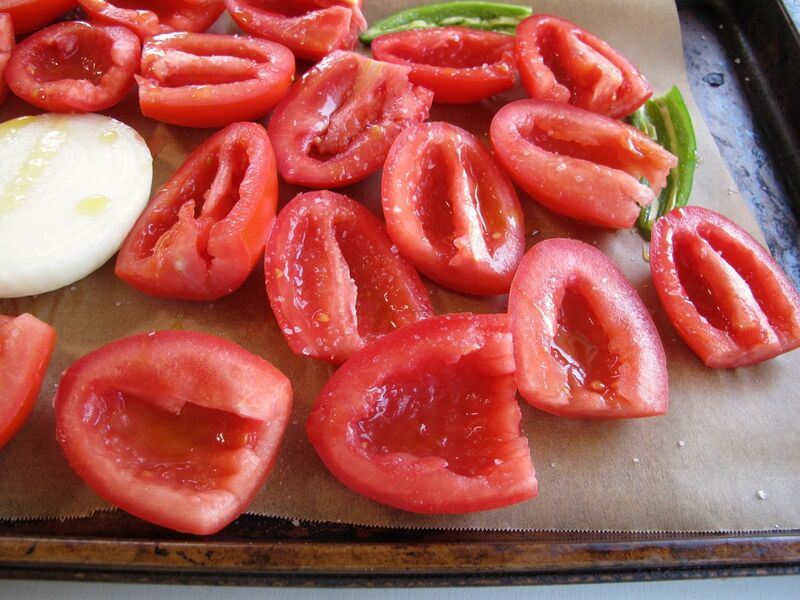 Let roasted ingredients cool slightly, then transfer the onion, garlic, serrano, and a few of the tomatoes to the blender. Blend until smooth. 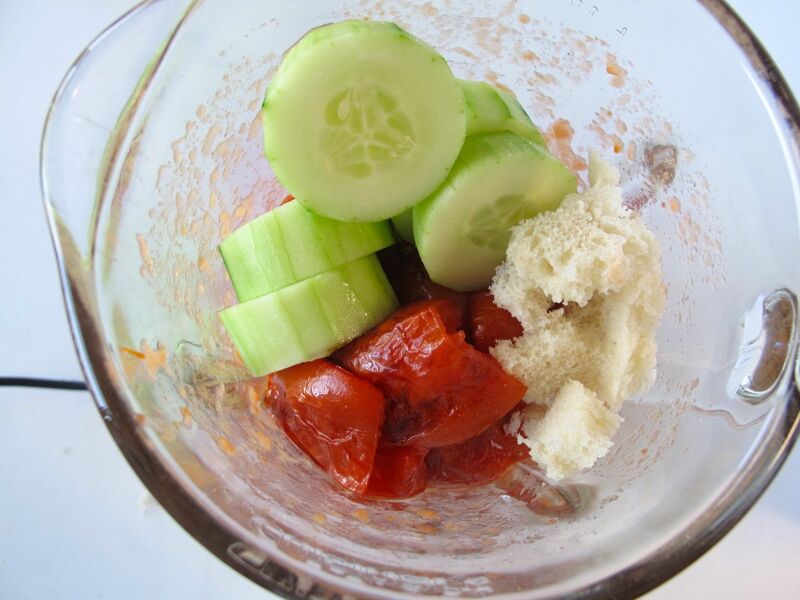 Then add the rest of the tomatoes, the bread, and the peeled cucumber to the blender. 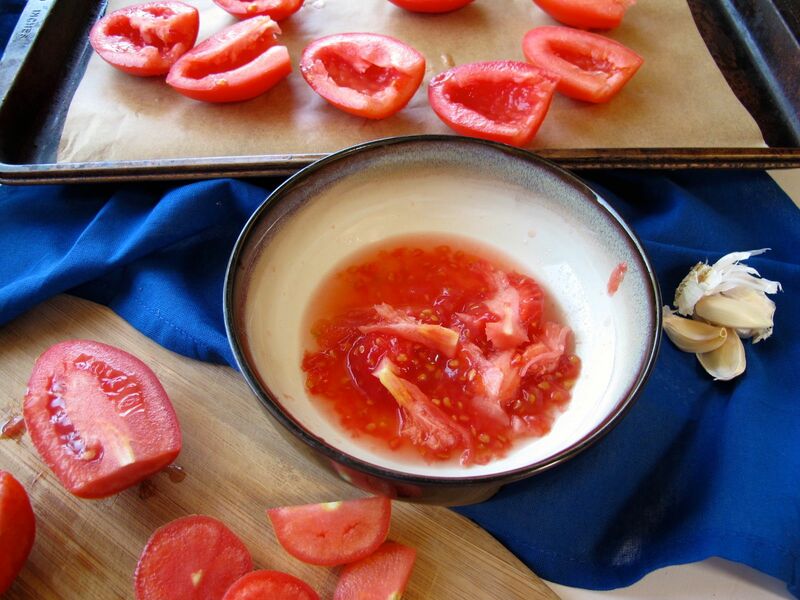 At this point, you could also pour the tomato seeds/pulp through a fine mesh strainer: add the “tomato water” to the soup in the blender, and discard the seeds. Blend until smooth. 3. Add the olive oil, vinegar/lime juice, salt, pepper, and hot sauce/chili powder (if using). Taste and adjust seasonings as needed. 4. Dice additional cucumber and bell pepper(s) as a garnish — you can stir some of them into the soup, and reserve some for sprinkling over the tops of individual bowls just before serving. 5. Store in an airtight container in the fridge for up to a week. The olive oil will separate out onto the top — just stir it back in before eating. Oh wow, I suppose if I were living in Spain again (I lived there briefly in 2001) then I might not even be motivated to make my own gazpacho, since I could sample gazpacho at many different restaurants instead! But I’ll take it as a compliment that this recipe looks good enough to try making to you, even though you’re in Spain… :) Thanks! Oh nothing tastes as good as the home made – and to be honest some restaurants buy by the litre!! thanks for coming back. Thanks for commenting, Debbie! 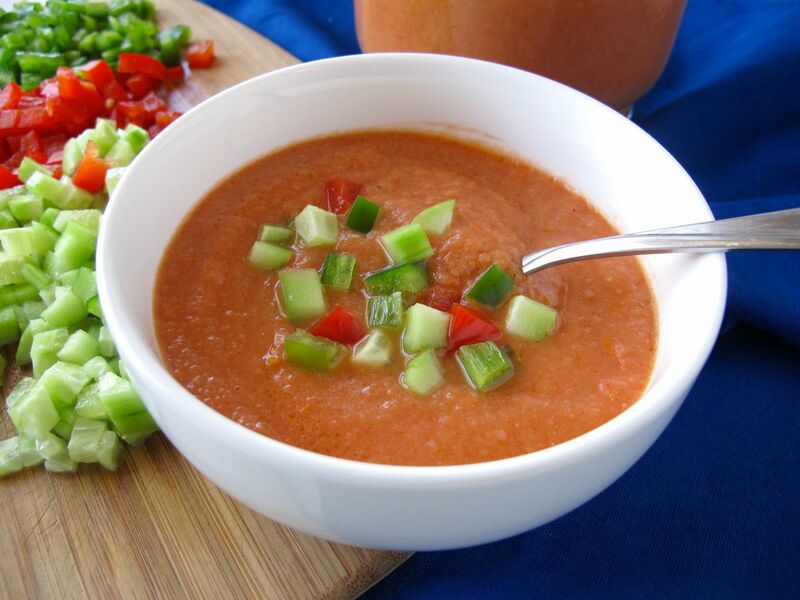 I love gazpacho and hope you enjoy it too… and now you have two recipes, since my other non-roasted version is also up on my site, in a (much) earlier blog post. It sounds – and looks – beautiful! Haha, sorry… that is the problem with looking at cooking blogs when you’re (potentially) hungry… :) I have that issue, too! 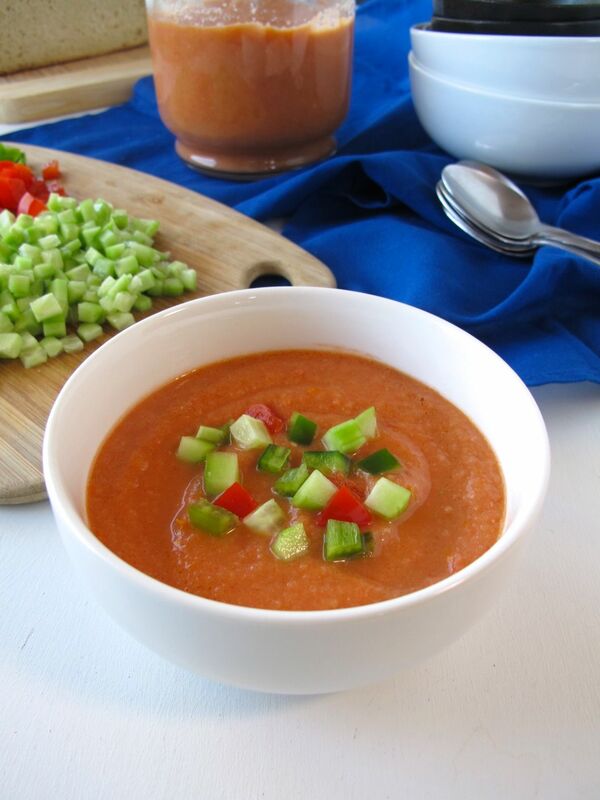 A tasty gazpacho is such a perfect summer dish! Pinned this one — looks great. I like gazpacho very much. 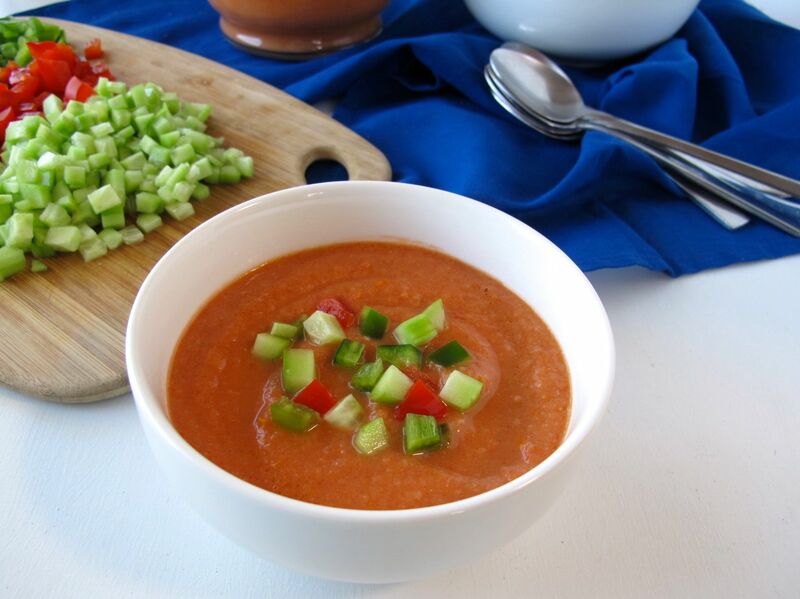 Of course, I’m spanish and I do a great gazpacho (I don`t add bread and I add carrot, sometimes…), normally in summer. I think in Spain there are many people doing wonderful gazpachos… but no one do it in the same way! I add the carrots in raw. 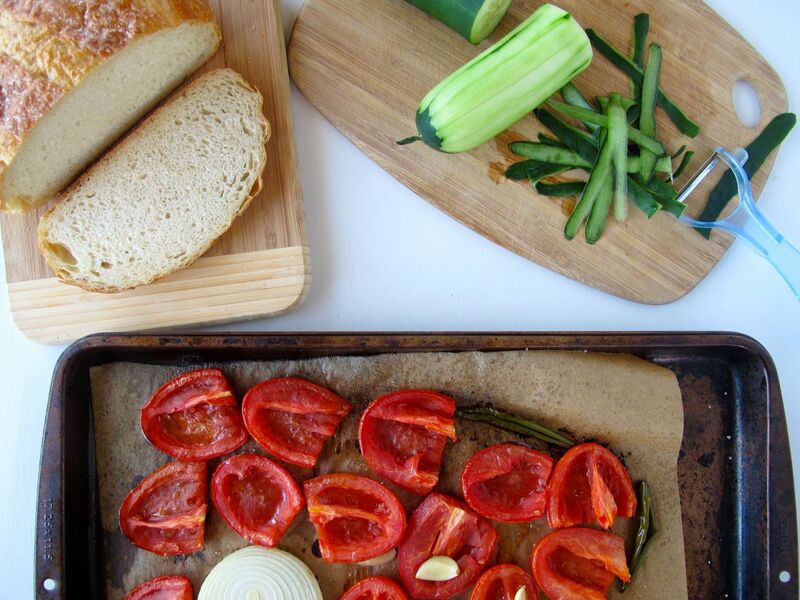 In my opinion, the paper of the bread is to get the gazpacho thickened, and I prefer another vegetables rather than bread to get that. In fact, I think one million kinds of gazpacho are so much, but there are a lot of them. 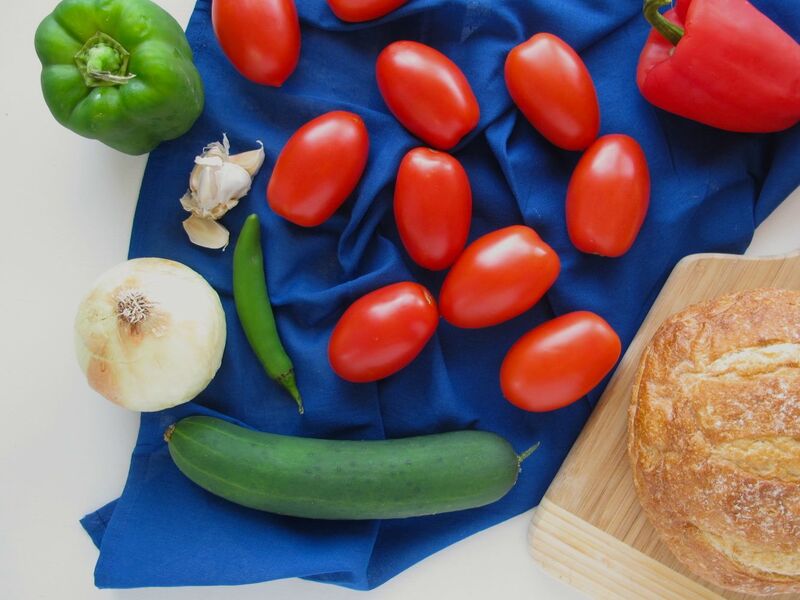 Thank you for sharing a spanish healthy recipe. I know the existence of another kind of gazpacho, called “ajoblanco” (white garlic), and I thik that is cooked with bread, garlic, olive oil…, but I cannot remember exactly now. I suppose that I must ask for the recipe to my relatives. So refreshingly good! 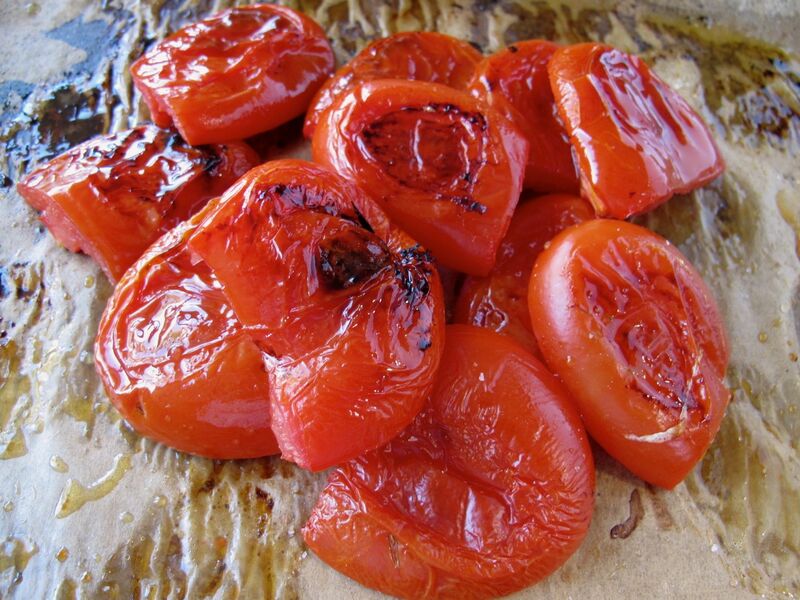 Love the depth of flavor of the roasted tomatoes. Thanks! Yes, I love it too… as long as I have a working oven and it’s not *too* hot in my apt. for the 30 minutes of roasting, I think I’m never going back to the way I used to make it! A lovely gazpacho. I’ve only made it once but this version sounds so tasty. I only discovered I liked it a couple of years ago as before that the thought of bread in a cold soup put me off. Thanks, Corina! Yes, it does sound strange to have bread blended into soup… (but then (toasted) bread DIPPED into soup is so so good, so it kind of makes sense!). Yum. Don’t get me started on gazpacho. I love it in all its forms, white, red, fruity, veggie. What a wonderful recipe! Enjoy!! Definitely pinning this recipe! 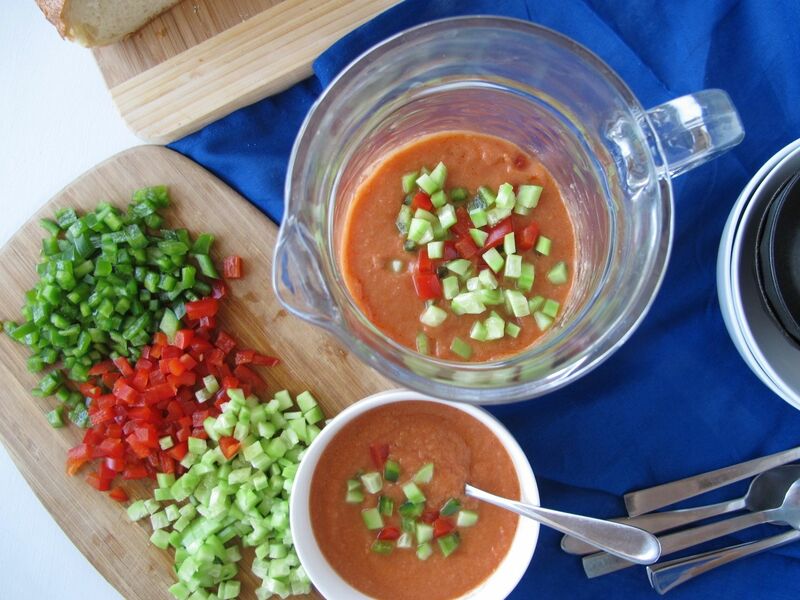 I love gazpacho and this recipe looks perfect!